BRADFORD’S Dave Brook made big strides forward at Thundersport GB’s fourth round of the year as he enjoyed his best race weekend of the season at Mallory Park. And now he is turning his attention to his road racing debut later this month, as he heads out to contest the Southern 100 at the Isle of Man. 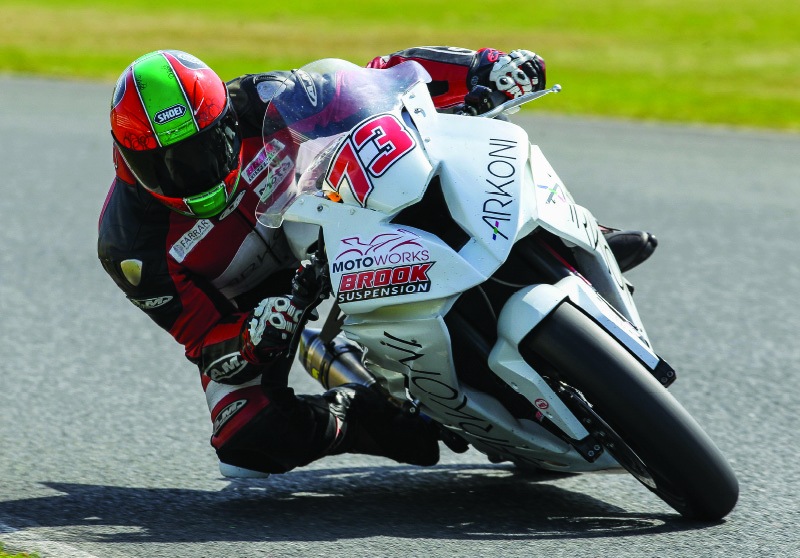 The Team Arkoni Racing rider is still working on his recovery following the huge crash last August, but after recently receiving good news from doctors earlier this month, he was keen to get back on board his BMW machinery for round four. And despite a little off in Sunday’s opening race, he believes it was his best round of the year yet in terms of results and improvements. The series’ annual trip to Mallory meant a strong grid, bolstered by British Superbike riders Richard Cooper and Billy McConnell aboard their Buildbase Suzuki machinery, and Brook was happy to qualify eighth ahead of the first race. “The format of the meeting played into my hands because we had a rest day between testing and the race days, which gave me a chance to recover from clocking more than 100 laps on Thursday,” he said. Finishing the race ninth, Brook had banked the seventh fastest lap time to give him a second row starting position for Sunday’s races, and he was hoping to get two strong results. However, things didn’t quite go to plan as day two got underway. “I got a decent start and was up to fifth by mid race distance,” he explained. “I thought I’d settle into my own race pace and chase a 52second lap but a split second decision after running slightly wide at Edwina’s forced me to run 100% throttle on what I now know are kerbs which should be avoided! After the off, Brook decided to sit out of the final race of the day and is now concentrating on his next outing, as he makes his Southern 100 debut later this month. Having always fancied a go at the roads, he has finally bitten the bullet this year and, after doing some laps of the Billown Circuit on his road bike, he can’t wait to head back for the event, which runs from July 12-15. “I’ve always wanted to try the roads and I suppose it was just an itch I had to scratch,” he added. “This year I don’t have the pressure of a championship to worry about so it’s freed up the calendar enough for me to have the time to do it. “If I’m honest, I’ve always wanted to race the Mountain Course used for TT and the Manx, but the Southern 100 will give me the chance to see what I think of the roads without the stress of learning 37miles worth of corners.” Brook continues to be supported by Arkoni, which supplies the construction industry with a full metalworking service, from design all the way through to installation. Managing director Mark Prentice has been delighted with his progress this season. “Dave has had a tough trek getting back to fitness after his smash last year, so we’re all thrilled to hear that he feels he has really turned a corner in the last few weeks,” he said.